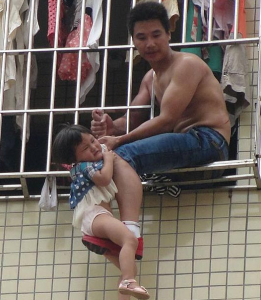 A photographer in China captured this horrific scene of a father dangling his three-year-old daughter from a sixth floor apartment window. 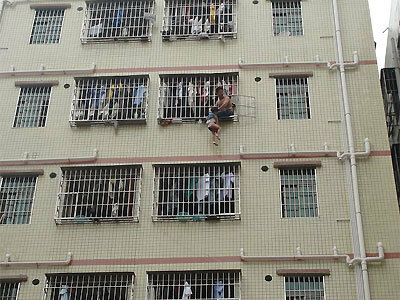 It is believed that an argument between the little girl’s parents led the father to open the window and hang her out over the street. The unstable dad could be seen holding the little girl by the wrist, only occasionally supporting her with his foot as she cried in fear. When police were called to the scene they set up an air cushion below in case she plunged to the ground. Witnesses say that the mom could be heard screaming inside the apartment begging him to bring the little girl back in. Eventually police stormed the flat and grabbed the dad after negotiations broke down. The little girl is believed to be alright after the traumatic episode. As expected, the father has been arrested. Amy Adams Gets Some On-Set Kisses From Aviana!